Are you just bursting with creative juices that you just need to find an avenue to let it all out? 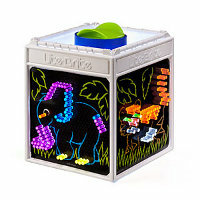 You might want to consider the $29.99 Four Shared Cube – Lite Brite then, as this little puppy allows you to conjure up your very own lighted artwork with another 3 friends to assist you. Boasting three hundred pegs, 8 pattern sheets as well as a quartet of blank sheets, it can fold flat (ala IKEA packaging) for easy transportation and storage. This is one toy that your kids can still continue to play, never mind that the weather has gone all dark on the outside, making it a far more creative alternative to video games if your kid loves being cooped up indoors. All you need to do is drop the cube in the middle of the table, and let each of your little tykes have a side to express their creative self. Powered by a trio of AA batteries, I would recommend rechargeables.